Free Flower Delivery within the City Limits! Floral Fantasies offers a wide assortment of beautiful flower arrangements and gifts for every occasion. We are available for custom orders and accompanying decorations, filling all your floral needs. Our great selection includes fresh and silk flowers, gift baskets, crafts and more. Floral Fantasies has been supplying beautiful flower arrangements and gifts for the local community since 2011. We have a wide assortment of fresh seasonal flowers, traditional bouquets, gift baskets, memory stones, silk plants and flowers, and other crafts. We are available for many occasions such as anniversaries, Valentines Day, birthdays, funerals, weddings, and church events. Our services include custom orders and accompanying decorations such as bows, balloons, ribbons, vases, candies and angels. We take pride in creating the perfect arrangement for each customer’s memorable occasion—and it shows. Our passion and enjoyment for our craft have made us the leading flower shop in Conway, MO. We offer fresh and silk flowers for every occasion. Our selection includes accompanying decorations and crafts to complete your order. We offer extensive expertise to create the perfect arrangements. Flower delivery is FREE within city limits! 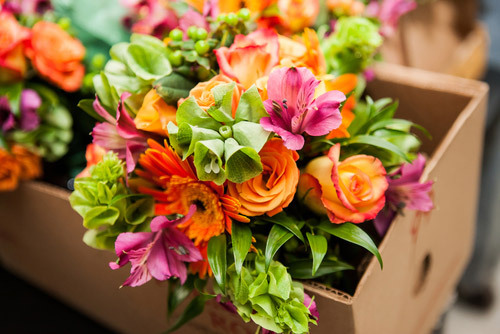 Contact Floral Fantasies today, and we’ll get started on a beautiful custom arrangement for your next special day.